Teachers attending these courses have really appreciated the mixture of hands-on and enjoyable activities combined with clear and well explained theory to pass on to their pupils. The relaxed and supportive style of the session fosters a real sharing of good ideas which are practical and fun. 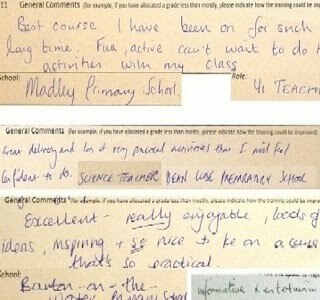 Check out these testimonials taken from sessions given in both Gloucestershire and Devon over the last two years. Full of ideas, hands-on, practical and above all, relevant to your lessons. "Excellent, loads of ideas, really enjoyable, inspiring."